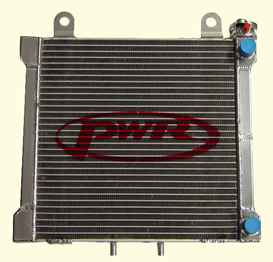 PWR Performance Products specialise in, and manufacture custom aluminium off-road motorcycle radiators for the motorcycle market place. 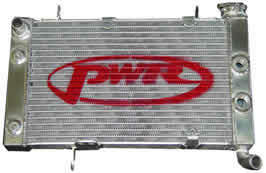 The constant on track testing environment with teams like RED BULL KTM, MOTOWORLD SUZUKI, CDR NOKIA YAMAHA, MOTOREX KTM RACING TEAM, WHALES KAWASAKI RACING and TEAM SHIFT MOTUL SUZUKI ensures that every customer receives the latest in R&D development and race proven performance technology . 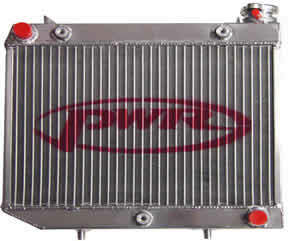 PWR radiators are manufactured by hand from our State of art facilities on the Gold Coast, where we produce all product from Hi-grade Aluminium incorporating a unique wider tube configuration and revolutionary louver fin design angle, which maximises the cooling efficiencies and disbursement of heat. 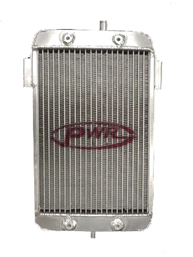 With these characteristics each PWR radiator will deliver consistent durability, strength and performance for today’s demands.Polished to near-chrome shine. 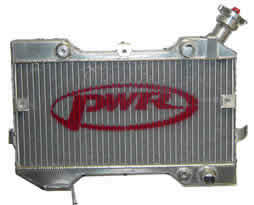 With 18 fins per inch and 100% TIG welded, PWR radiators are strong and durable. 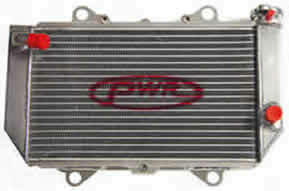 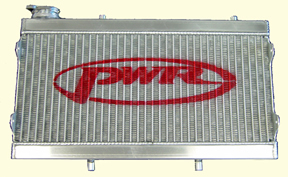 PWR All-Aluminum radiators are made from aircraft quality aluminum.